Weddings are such wonderful occasions and I especially love working at such events if they’re local to me. As a Toastmaster in Watford, or its general proximity, I thoroughly enjoy such celebrations in and around the locality where I live. 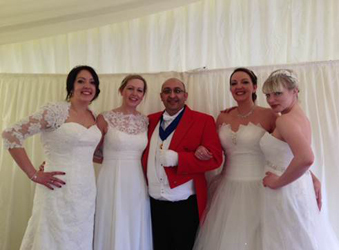 My duties as a Master of Ceremonies have seen me work as a Toastmaster in a range of the fantastic wedding venues in Watford. And it’s always lovely to work with people in a local environment and I’d be delighted to help you on your special day. A Toastmaster is there to help you enhance that special occasion and ensure it has the magic, splendour and that special touch you deserve. I’m there to help you and with my Toastmaster services in Watford you will enjoy all the assistance and the leadership a professional Toastmaster can bring. I love being a Toastmaster and feel extremely passionate about what I do. I’m there to help the bride and groom and both sets of their relations to feel at ease on such a significant but most of all, wonderful day. My naturally organised nature and positive, friendly demeanour are certainly characteristics I feel will help ensure your day goes splendidly. To be frank, my main aim as a Master of Ceremonies in Watford or elsewhere is to ensure your day goes splendidly and is completely stress free. My professional training and membership of the Toastmaster & Master Of Ceremonies Federation (TMCF), which was founded in 1954 and the Toastmaster’s General Council, assure you peace of mind. You can expect the very best from me and no matter what you need to discuss or question you need to ask, or request you have, you can be sure I’ll help. From the smallest detail, to the biggest qualm I’m there to ensure everything runs splendidly. As a person who has been a Toastmaster in Watford and London I’m well versed in the locality and if you’re from elsewhere can help you in this regard too. I also work as a Toastmaster for Bar/Bat Mitzvahs in Watford and have performed Master of Ceremony duties at a wide range of charity, corporate and other formal events in the area too. I’m always more than delighted to discuss people’s needs and if you have any questions about my work as a Toastmaster or Master of Ceremonies in Watford then please feel free to contact me – I’d be delighted to help you out. So, if you’re looking for a Toastmaster in Watford – please get in touch.